The chief of the European Commission has warned US president Donald Trump against encouraging countries to copy Britain's exit from the EU, arguing that a break-up of the bloc could lead to a war in the Balkans. Jean-Claude Juncker, speaking in an interview with the Financial Times, called Trump's enthusiasm for Britain's departure from the EU "annoying" and "surprising." Trump did indeed express his approval for Britain’s departure from the bloc, even labeling himself 'Mr. Brexit' during the US presidential campaign. He also became closely associated with the populist right-wing British politician Nigel Farage, then the leader of the UK Independence Party, who was one of those who led the push for the UK's exit from the EU. Juncker said he delivered his warning via Vice President Mike Pence during his visit to Brussels last month. 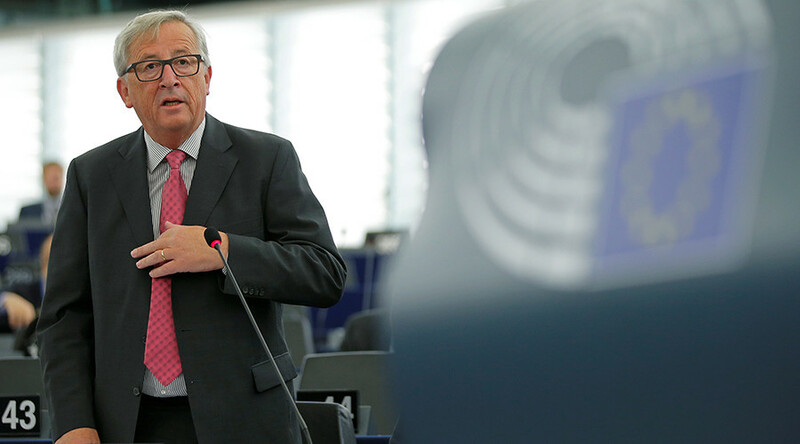 “I told the vice president, ‘Do not say that, do not invite others to leave, because if the European Union collapses, you will have a new war in the Western Balkans,’” Juncker said. The 62-year-old European Commission president stressed that the prospect of EU membership is extremely important for Balkan countries, so they do not become engaged in another war. “If we leave them alone — Bosnia Herzegovina, Republika Srpska, Macedonia, Albania, all those countries — we will have war again," he said, referencing the conflict that broke out between Serbs, Croats, and Bosnian Muslims in 1991, and ended after a NATO-led intervention. Juncker went on to state that Trump's “America First” rhetoric had frightened Europeans, noting that "for the first time in post-war history we have an American president giving the impression he is not interested in European affairs." Although Juncker plans to visit Washington next month, he said he is uncertain about whether he will meet with Trump. "They're trying to fix it, but he has other priorities," Juncker said. He went on to note that Trump "does not understand anything about Europe," noting previous confusion regarding him and European Council President Donald Tusk. "He had Tusk on the phone and he thought it was me," Juncker said. Juncker’s comments come as the leaders of the 27 remaining EU member states prepare to meet in Rome for an informal summit to mark the 60th anniversary of the 1957 signing of the Treaty of Rome. The agreement established the European Economic Community (EEC), which later gave rise to the European Union. British Prime Minister Theresa May – who plans to trigger Article 50 to kick-start Brexit on March 29 – was not invited to the summit.